See recent and expected tuition and fees for Bryant and Stratton College - Milwaukee, as well as how these prices compare to the U.S. average. Learn how tuition and fees at Bryant and Stratton College - Milwaukee compare to other U.S. colleges and universities and learn what you can do to effectively plan for possible tuition increases. The next table outlines how Bryant and Stratton College - Milwaukee measures up to other schools nationally, regionally and by state. How Much Will Tuition & Fees Be for Bryant and Stratton College - Milwaukee? Full-time undergraduate students at Bryant and Stratton College - Milwaukee were charged $15,690 in fees and tuition for the 2017 - 2018 academic year, before modifications for financial aid. Of that number, the cost of tuition came to $15,569. $121 was fees. As opposed to public colleges, Bryant and Stratton College - Milwaukee does not offer a tuition discount to residents of the state. Fees and tuition prices quoted here do not include room and board, which will drive up your costs. Yet, many students end up paying under full tuition after collecting financial aid as well as other rate reductions. View the table below to see 2017 - 2018 school year costs. Go to the Part Time Tuition & Fees page to learn more. There has been an increase of 2.9% in Bryant and Stratton College - Milwaukee fees and tuition for out-of-state students in the past 5 years. Tuition grew by 2.9% and fees grew by 0.0%. This year, undergrads should expect to pay $16,139 if the growth keeps up. Because of price increases, the full cost of a four-year Bryant and Stratton College - Milwaukee degree will be $67,378, and the full price of a two-year degree would be $32,739, not including other charges for books, transportation, and room and board. 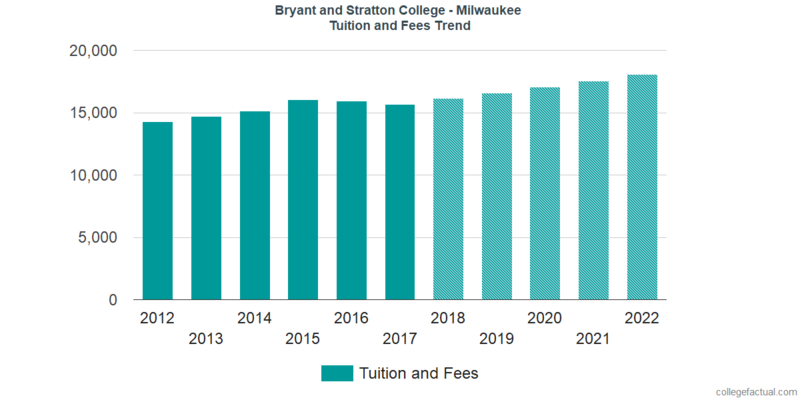 View this next chart to see how Bryant and Stratton College - Milwaukee fees and tuition might develop in the future. Mainly due to inflation as well as other factors, the price of college is likely to increase every year. For this reason your final year of college could be much more than your first year.